We in the UK are in for a hard winter as following Wednesday’s Comprehensive Spending Review the cuts in public services begin to make themselves felt. Although we were expecting the Con-Dem coalition to make the most of the political opportunity to greatly reduce the public sector and the welfare state while blaming it all on the previous New Labour government, hearing the actual news still came as a shock, and there will doubtless be many more shocks as the planned spending cuts are introduced. 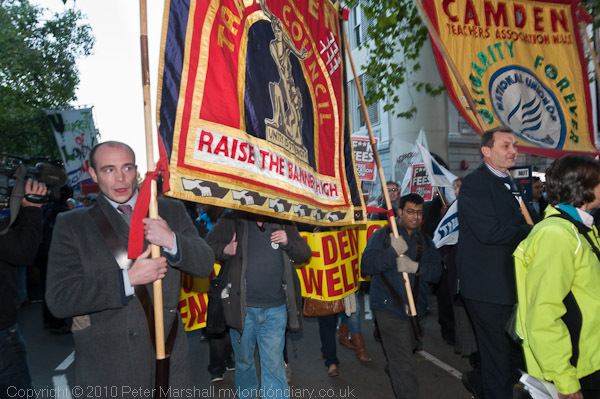 So far the official trade union movement response has been relatively quiet and low key – they are planning a national demonstration for early next year, many are calling for earlier and more decisive actions. 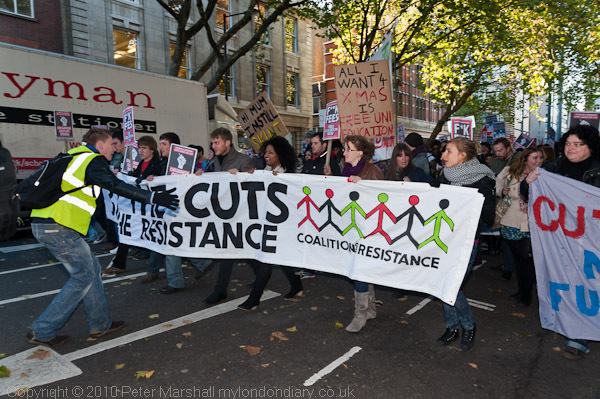 The demonstration at Downing St was called by ‘The Coalition of Resistance’ which describes itself as ” a broad united national campaign against cuts and privatisation in our workplaces, community and welfare services, based on general agreement with the Founding Statement” which appeared in the Guardian in August 2010, signed by Tony Benn and 73 other people including MPs, union leaders, writers and others. 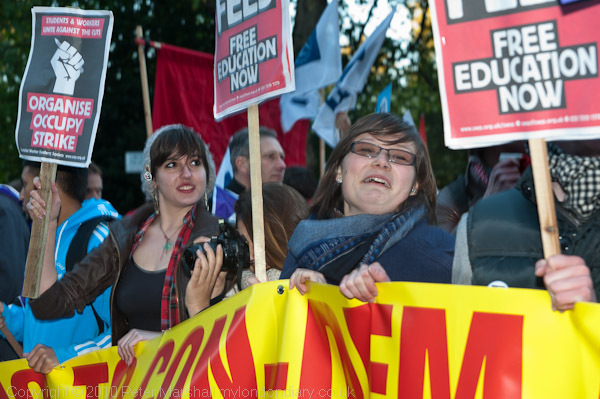 It is now supported by “thousands of individual supporters, together with national unions, union branches, anti-cuts campaigns, student, pensioner, unemployed, youth and other organisations” and is still growing. It’s hard to get a large group of people to a demonstration on a Wednesday evening. Around 300 students set off from Malet St in the late afternoon and joined roughly twice that number of trade unionists and others waiting for them at Lincoln’s Inn Fields. Doubtless others met them at Downing St, making this a significantly sized event, but rather smaller than the 20,000 who marched in Edinburgh at the weekend. It was a busy day for me – earlier I’d been listening to Jesse Jackson and lobbying my MP and afterwards I was giving a speech at the opening of our contribution to the East London Photomonth 2010 at the Shoreditch Gallery. I’d decided I couldn’t carry around my normal large camera bag all day, so was working with just a single camera – the Nikon D700 – along with my lightweight but slow 55-200mm Sigma and the SB800 flash. Of course 24mm is quite wide, but I did find I was missing the even wider 16-35mm, particularly when working in the crowd. And having only a single camera meant I took very few pictures with the longer telephoto. I’ve rather got out of the habit of changing lenses when working. Malet Street, where the student march gathered is pretty gloomy most of the time, with trees and tall buildings cutting down the light, and by 4pm it was beginning to look like dusk. For some unaccountable reason I decided to leave the camera set to ISO 640 when the sensible thing to do would have been to use ISO1600 or even 3200. By the time I finished working at Lincoln’s Inn Fields it was really beginning to get dark. I took a few pictures without flash – at f2.8 which is a pretty useful aperture, but most were with the flash giving an aperture of f6.3 – in the earlier pictures the flash was a fill, but later on it was the main light source with fill coming from the ambient light. I still find the combination of two slightly complex electronic systems impossible to really understand, but mostly with a little fiddling on the flash setting it at different levels I manage to get the results I want. I had to leave as the march left for Downing St, and then needed to work out how to get to Shoreditch when the march was stopping the bus I normally take! More pictures and text on My London Dairy. This entry was posted on Wednesday, October 27th, 2010 at 06:57 pm and is filed under My Own Work, Photo Issues, Political Issues. You can follow any responses to this entry through the RSS 2.0 feed. You can leave a response, or trackback from your own site.